Preheat broiler. Line a heavy baking sheet with foil. Arrange peppers, cut side down, on baking sheet and surround with garlic. broil until peppers are blackened and garlic is tender, turning garlic often. Cover complete pan with foil and let stand until cool enough to handle. Working over a bowl, peel and seed peppers, reserving juices. 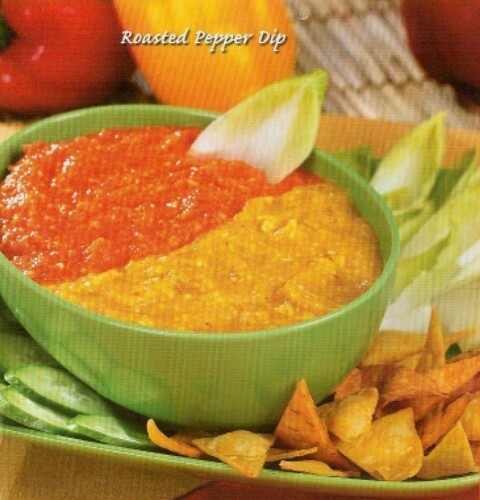 Keep red and yellow peppers separate. Transfer to separate bowls. Peel and chop garlic. Finely chop 1/2 cup almonds in food processor, add yellow peppers, half of garlic, 1/2 Tbsp. oil, 1/2 tsp. vinegar, pinch of cayenne and 1 tsp. of reserved pepper juice. Puree. Season with salt and pepper and transfer to small bowl. Using clean food processor repeat steps with remaining ingredients, as instructed for yellow peppers. Simultaneously spoon each puree into serving bowl. Shake bowl gently to allow pure´e to meet in the center. Serve with crudites and chips.